20 Vials 20 ml. | NET: 400ml. 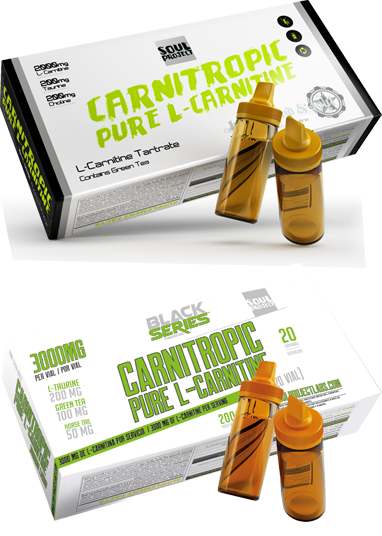 Carnitropic helps to eliminate the fat thanks to its unique combination of stimulants that increase the metabolism, and of natural diuretics that help to eliminate liquids. Also, vitamin B6 provides a total absorption of all nutrients. 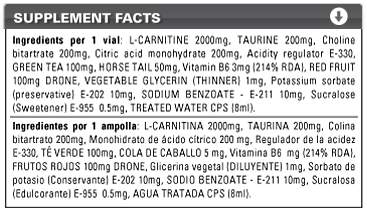 2000mg L-carnitina / 3000mg L-carnitina, colina bitartrato, taurina, té verde, cola de caballo, vitamina B6, aroma, conservantes (sorbato potásico, sodio benzoate), edulcorante (sucralosa E-955), regulador de la acidez (E-330), glicerina (humectante), agua. Take 1 vial per day, preferably half an hour before meals or training. 2000mg L-carnitine / 3000mg L-carnitine, choline bitartrate, taurine, green tea, horse tail, vitamin B6, aroma, preservatives (sorbate potassium, sodium benzoate), sweetener (sucralose E-955), acidity regulator (E-330), glycerin (moisturizing), water. Food Supplements should not be used as a substitute for a varied and balanced diet and a healthy lifestyle. Do not exceed recommended daily intake. Keep out of reach of children. It contains sweetener.